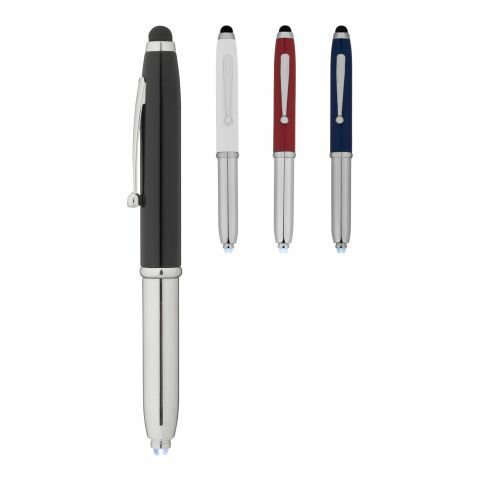 Our metal ballpoint pens, with your logo across the side, will help increase brand recognition for your company. Promotional products are used by all sucessful buisnesses, whether they be students, working professionals or seniors, which will ensure your branding is exposed on a regular basis. The promotional pen is one of the most used items for advertising in the UK and the metal ballpoint pen specifically with its more premium look, will give customers the impression that your brand is of a high standard and quality. Promotional pens & pencils are a great way to connect with new customers or show appreciation to existing ones. They are professional, sophisticated and loved by recipients. Not to mention the fact that pens are often borrowed or shared with peoples friends, family and business associates. You never know where your custom pen is going to end up or who's hand it will land it. It could just be your future biggest client! As printed pens come at such a low cost per unit, you can get more bang for your buck when you order in bulk. By ordering more, you increase the chances that someone who might be interested in doing business with you ends with your pen in their hand, on their desk or sitting comfortably in their breast pocket. Reach out to new and existing customers sooner rather than later by ordering your promotional pens today! Our metal pens have a premium appearance and a low cost, making them the ideal giveaway items. Pens are used every day and therefore will give ample opportunity for your branding to be exposed to the public. According to hearsay, even Galileo designed many of his drawings and sketches using a simplified version of the pen. Nowadays pens are common enough but metal ballpoint pens however, through their elegant design and heavier weight, convey high quality and prestige. These metal ballpoint pens are equipped with a cartridge for storing fast drying ink and a rollerball located at the tip of the pen, allowing the ink to flow easily across paper. They also have a stroke width of approx. 0.7 to 1.4 millimetres. Rely on premium products of this category and supply your target group with a useful classic. Have these pens engraved, printed or both to set yourself apart from the crowd. There are many variations of the standard metal pen in our web shop. Some of these include rubber attachments, logo printed stylus pens and screen cleaners, making them multi-purpose and infinitely useful to your clients. As with all of our products, you can personalise these pens your logo, slogan or personal message to strengthen your advertising campaign. We suggest engraving these metal ballpoints to add a more personalised and premium touch to your gift. We even have promotional highlighters in stock should you want to put together a creative gift bag to build your brand awareness! These premium promotional pens, stamped with your logo or slogan, will come in handy at various events, exhibitions and other merchandising opportunities. They can be given out to clients, co-workers and business partners with no limitations in the demographics you can target. You can order and personalise these pens in large quantities because they are so low-cost, and keep them readily available to hand out, for example, in the middle of a conversation, or at the end of a business meeting. The branded pens will help create new relationships, strengthen existing ones, and increase brand recognition. These giveaway items will attract attention towards your booth during exhibitions, as well as generate brand impressions afterwards. These personalised pens are also suitable as promotional gifts bags at your events, these can include other similar items from our shop like tote bags, note pads, keying’s and pencils. These creative promotional gift bags are the ideal way for your company to show attention and appreciation towards your target group and make your brand more memorable. The metal ballpoint is a versatile branded promotional pen. Personalise your pens in a variety of colours, styles and logo designs. You can also have these pens engraved for a much more personal look. If you’re not sure where to start, our friendly team will help you with every stage of the design process. Order your personalised pens today and subtly keep your company in the mind of your customers.